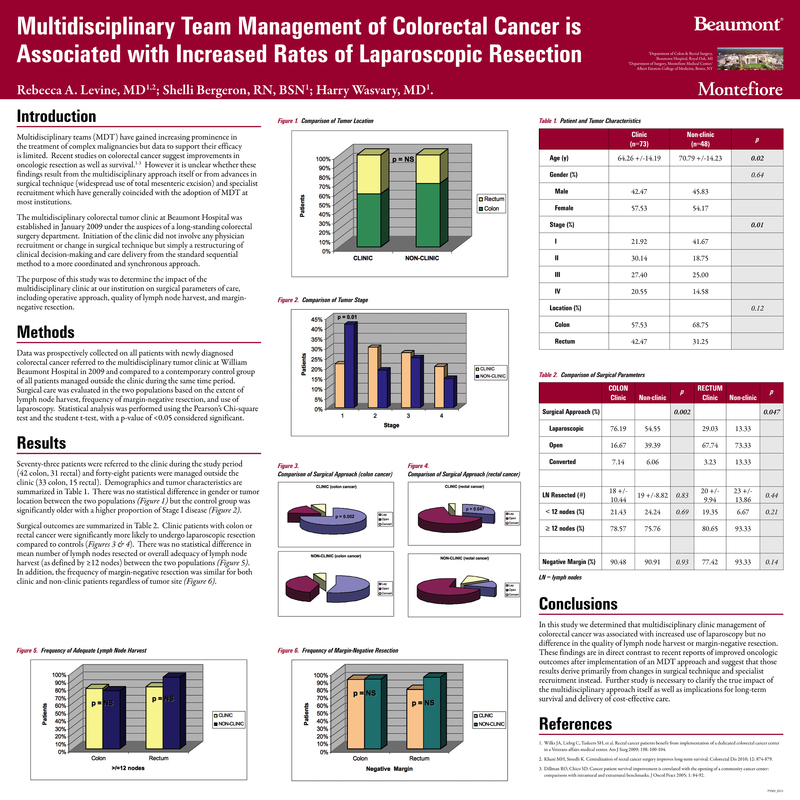 INTRODUCTION: The purpose of this study was to determine the impact of multidisciplinary team management on surgical care of colorectal cancer. Multidisciplinary clinics have become increasingly prominent in the treatment of complex malignancy but data to support their efficacy is limited. We investigated the influence of the colorectal cancer clinic at our institution on surgical parameters, including operative approach and the quality of oncologic resection. METHODS: Data was prospectively collected on all patients with newly diagnosed colorectal cancer referred to the multidisciplinary tumor clinic at William Beaumont Hospital in 2009 and compared to a contemporary control group of all patients managed outside the clinic during the same time period. Surgical care was evaluated in the two populations based on the extent of lymph node harvest, frequency of margin-negative resection, and use of laparoscopy. Statistical analysis was performed using the Pearson’s Chi-square test and the student t-test, with a p-value of <0.05 considered significant. RESULTS: Seventy-three patients were referred to the clinic during the study period (42 colon, 31 rectal) and forty-eight patients were managed outside the clinic (33 colon, 15 rectal). There was no statistical difference in gender or tumor location between the two populations but the control group was significantly older with a higher proportion of Stage I disease (see Table 1). Surgical data is summarized in Table 2. Clinic patients with colon or rectal cancer were significantly more likely to undergo laparoscopic resection compared to controls. There was no difference in adequacy of lymph node harvest or rate of margin-negative resection. CONCLUSIONS: Our findings indicate that multidisciplinary clinic management of colorectal cancer was associated with increased use of laparoscopy but no difference in the quality of oncologic resection. Further study is necessary to clarify the implications of this data in the context of patient outcomes and delivery of cost-effective care.